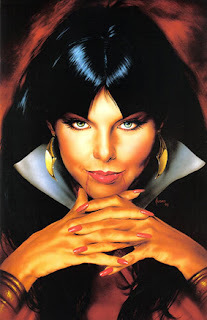 • PLOT SUMMARY: Pendragon reads, or rather experiences, Vampirella's journal in a series of 2-page spreads. Written by David Quinn & Sean Fernald. 4-page Pendragon sequence drawn by Louis Small Jr.
& Caesar. 2-page spreads drawn by: Rudy D. Nebres, Jim Silke, Mark Beachum, Amanda Conner & Jimmy Palmiotti, Scott Hampton, Michael Bair, Alan Davis & Mark Farmer, Louis Small Jr. & Rob Stull, Nelson, Jimmy Palmiotti & Al Williamson, Gary Frank & Cam Smith, Caesar & Michael Bair. Pin-up by Jose Gonzalez. Cover by Joe Jusko.